During the energy crisis of the mid 1970’s Moulton B. (Molt) Taylor decided to turn to a small, easy-to-build, light plane which focused on maximum cruise speed and efficiency. The result is the Taylor Mini-IMP. The Mini-Imp is a two-seat version of the single-seat Imp designed in 1975. It features an unusual configuration with a pusher prop aft of an inverted V-type tail assembly and cantilevered high wing that folds back for towing and storage. The wing is the latest NASA design with spoiler and flaps. The retractable gear is the tricycle spring-legged type. 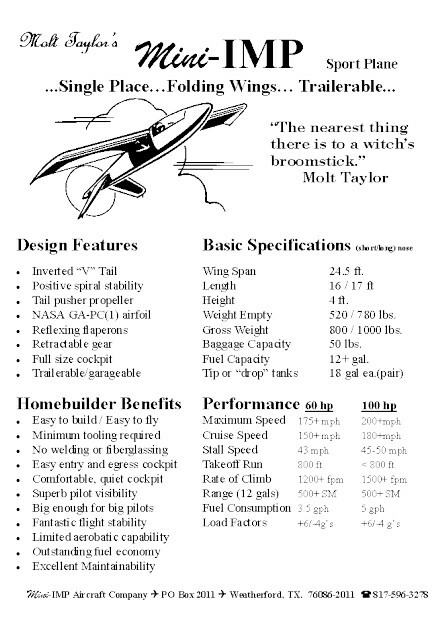 A con-trollable propeller is available. Power is provided by any engine from 60 to 115 hp with the 60-hp Franklin, 60-hp Limbach VW, 70-hp Tur-bo Revmaster VW, 100-hp Continental or 115-hp Avco Lycoming modification being the most common. The aluminum and fiberglass Mini-Imp requires a minimum of tools to construct, and all hard-to-build parts are available. It offers unequalled safe flyability and stabili-ty, positive spiral stability, limited acrobatic capability (stressed to 9 Gs), and good fuel economy (3 1/2 gph). The O-200 powered price in 1982: $10,000 (Includes complete kit). All metal construction. Year. Units delivered to June 1982: 50. The Model “C” version of the Mini-IMP is the long nose version which was developed after the prototype was flown with the Limbach converted VW engine. The Model “C” is powered with the Continental O-200 engine (100 HP at sea level at full throttle). The Model “C” also incorporates a larger baggage compartment and the nose is lengthened 12 inches so that the pilot sits one foot further forward of the main bulkhead. This lengthening of the nose required the installation of an additional vertical fin on tip of the tail boom giving the “long nose” Mini-IMP an inverted “Y” tail configuration. This addition was used instead of lengthening the tail boom to accommodate the longer nose length of the design rather than lengthen the shaft and to accommodate the further aft placement of the propeller (with its weight effect on the CG). The O-200 powered Mini-IMP requires the use of a different propeller and due to the increased weight of the engine a heavier landing gear is used. The drawings indicate several other areas of change for the Model “C” needed to accommodate the higher power and resulting performance increases. These include heavier side frame members and a different nosewheel installation. When ordering “kits” be sure to advise of your preference in this regard. The same set of drawings is used to cover either version of the Mini-IMP (the long nose or the short nose). It is practical to use the long nose version with the big baggage compartment if the builder intends to use the turbocharged Revmaster engine and controllable propeller. However, if the normally aspirated Revmaster engine and a fixed pitch propeller (or other such VW conversion) is to be used, the short nose configuration should be used. A prototype of the Model “C” has been flown extensively and its improved performance with the higher power is evident. Flight tests of the O-200 powered Mini-IMP “C” have shown a cruise speed of approximately 175 MPH at 4000 foot altitude at 75% rated power. Climb speeds of better than 1500 FPM are initially available at full throttle. These performances are obtained at approximately 1000 pounds gross weight. Exact performance to be obtained with any engine combination is of course dependent on the power level the builder wants to pull from his engine/propeller installation. The O-200 Model “C” requires approximately the same takeoff and landing run as the VW versions, with exact performance dependent on temperature, altitude, and gross weight. The Mini-IMP Aircraft Company has been formed to keep the aircraft design available, to provide builder support and to further promote this wonderful aircraft design.